I have always loved the sound of the ukulele. Ever since I heard the famous “Over the Rainbow” medley by Israel Kamakawiwoʻole, I’ve been a big fan of the instrument. I picked up the Lanikai soprano ukulele because I’d already been playing for a while and wanted to upgrade my sound. I am having a ton of fun playing this beginner ukulele. The most important thing to keep in mind when you buy a soprano ukulele is that it is a very small, delicate instrument. I don’t mean that it is fragile, in fact this model seems very durable. I mean that the sound is naturally quiet and high pitched. If you think about the sound of a ukulele, you will probably understand what I mean. With that said it is a lot of fun to play and is a great way to make music without bothering your neighbors. 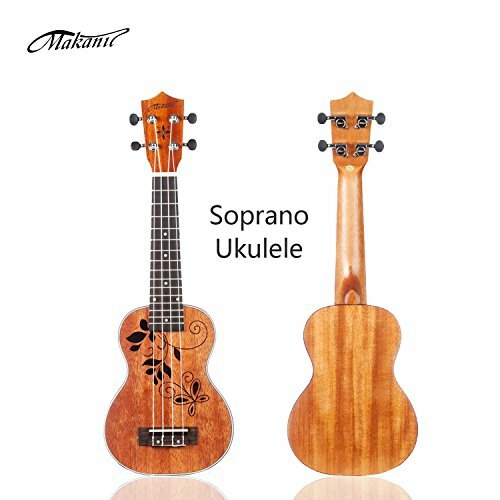 The Lanikai soprano ukulele offers a great value both with the instrument itself, and with the extra goodies included in the package. If you are a beginner, you can learn a lot from the included instructional DVD. I was glad that the package came with a gig bag and tuner so I didn’t have to buy any extra accessories after the initial purchase. I did some research and discovered that the tone is thanks to its body of eastern mahogany wood, also known as “nato”, and a rosewood fingerboard. This ukulele has been a lot of fun to play on. I am very happy with the construction quality of this ukulele. The eastern mahogany body gives it a warm tone with strong midrange projection and the rosewood fretboard feels nice on my fingers as I play. This model seems quite durable, which is a good bonus. You may know that restringing a ukulele takes a little bit of time to do. It’s the last thing you want to deal with when you first buy an instrument, so the fact that the Lanikai model comes ready-to-play is a big bonus for me. Transporting a ukulele can be tricky business. You might not own a travel bag that easily fits its unique shape, and standard guitar cases will not work as a substitute. The fact that this model comes with a gig bag makes it very easy to travel with the instrument. The tuners on this model are pretty solid. I was able to tune once or twice per session and then not worry about it. The chrome is a good look and feels sturdy, so I never had to worry about the tuning pegs while I was playing or transporting the instrument. Even though I had already been playing ukulele for a while, I learned some new tricks from this DVD. You’ll love it if you want a guide to the most common ukulele chords and techniques. It’s always good to have some instruction when you sit down with a new instrument. The Kala model is another good intermediate ukulele for people who either want to learn the instrument or perhaps upgrade from a cheaper model. It is made with mahogany and rosewood and produces a good amount of sound for the size of the instrument. The one drawback of this model is that it doesn’t come with as many accessories as the Lanikai does. The ADM 21” Soprano Ukulele is a good purchase if you need the ultimate value option. It comes with a strap, tuner, and gig bag which just about everything you need to start playing. At this much more affordable price, you are sacrificing some tone quality. Nonetheless it’s a good option if you want to get started today and don’t want to spring for the more expensive models. The Makanu soprano ukulele is another value-oriented model that has an interesting appearance, incorporating traditional Hawaiian artworks into the finish. The tone is good for the price although not quite as smooth as the Lanikai model. This is a great value proposition if you want an affordable and interesting looking ukulele with solid construction. 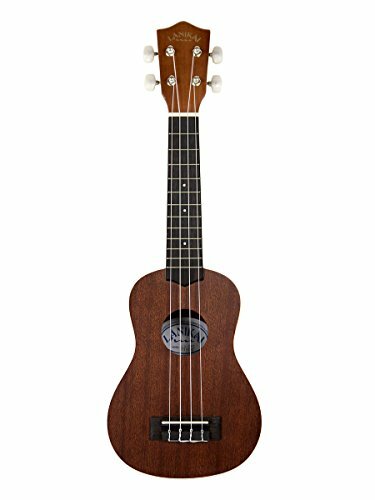 The Lanikai soprano ukulele was an excellent upgrade for me after my first few years of playing. The construction quality is great, I can really hear the strong midrange tone that is produced by the eastern mahogany body. It’s a nice bonus that you can learn a lot from the instructional DVD included in the package. The ukulele is a great instrument to play and I hope you’ll enjoy it regardless of which model you purchase. If you’d like to get a little more knowledge about ukuleles before you purchase, you can take a look at our best ukulele reviews for beginners.